What’s Next After Receiving Your Offer of Admission? - SchoolFinder.com! What’s Next After Receiving Your Offer of Admission? Read this before you click accept! You received your offer of admission -- congratulations! Before you hit accept, ask yourself these questions and make sure you feel confident in choosing the university that’s right for you. Do I like the campus? One of the best ways to ensure you’re making the right choice is to take a campus tour. While on campus you can learn a lot, but the way you feel is most important. Read our top five tips for campus tours. Get on campus, take a look around, and try and to picture yourself going to school there. If you can’t picture it or something doesn’t feel right, this can be a sign that the school isn’t right for you. Remember, this is where you’ll spend the next 4+ years of your life, how you feel is an important factor to consider. Do I like the city? Going to university could be a big change. You could be living away from home for the first time. Being in a city that has the things you’re used to can make a big difference in how easily you adjust. 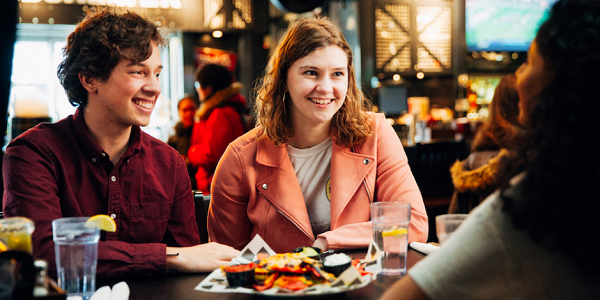 While large cities offer a lot to do, smaller cities such as Waterloo, which is home to 50,000 university students, also offer lots of coffee shops, restaurants, and shopping in a more friendly setting. If you have a favourite hobby, a favourite food, or a preferred way to spend your weekend, see if the city offers these things. If you absolutely love a specific dish from back home, being able to eat that while at university can help you feel closer to home. If you’re used to having a mall or movie theatre nearby, see if these types of things are easy to access. Do I really know which program is best for me? When it comes to comparing programs there are a lot of factors to consider! If you can’t make up your mind, we suggest you take some time to compare programs. We recommend starting with a look at the courses that are required for your program. If the courses don’t interest you, chances are you aren’t going to enjoy your program. Choose a program that has classes that you’re going to be excited to attend! Check if the programs you’re interested in have any hands-on opportunities, which can really enhance your learning and give you a competitive edge when you graduate. See if the schools you’re interested in offer any co-op, internship, or travel abroad opportunities. Take a look at everything you can get out of your program. Some programs offer specializations or minors that can add to your degree. These can be great if you want to study subjects in further detail, or explore an area that isn’t directly related to your program. Will I have everything I need? School is a big investment, and you may need some help paying for it. Are there scholarships or easy ways to make money while at university? Do you know where you’d like to live? Are the types of housing you’d like available? Is the price something you’re able to pay, or do you need to search for cheaper options? These questions are important to ask now so that you don’t end up with a not-so-fun surprise later. We also recommend you take transportation into consideration. If you have a car, parking may be an expense to keep in mind. If you rely on public transportation you may want to check out a city bus schedule and see if where you plan to live has any nearby bus stops.